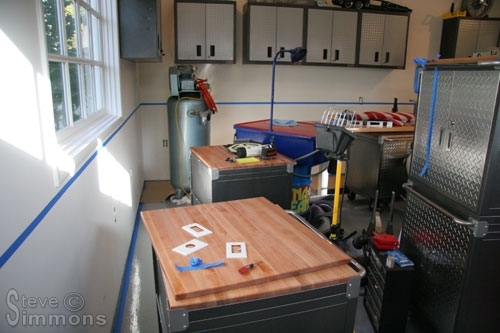 The workbench and the first set of cabinets are installed. Things are getting neater, and it feels really good. 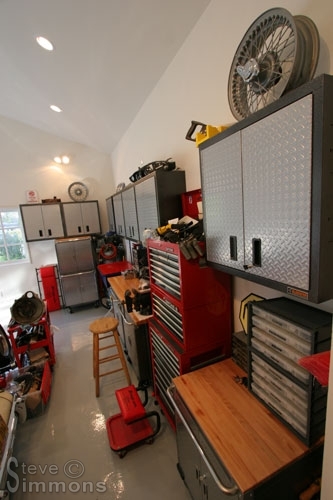 All cabinets and tool boxes are placed on casters for easy maneuvering and cleaning. The wall cabinets are installed and bolted directly into wall studs for strength. Above them is the first load of decorations that will eventually grace the walls and cabinet tops. Cabinet height is set so that the first two shelves can be reached without a step stool. 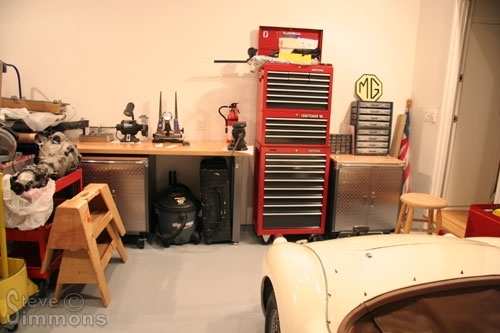 I didn’t want them any lower because it would crowd the work space over the workbench, solvent tank, etc. 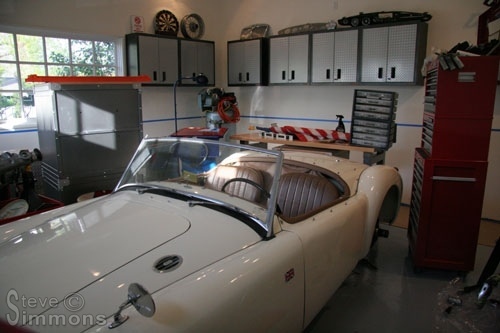 Another angle of the workspace, showing the extra work counter and parts cabinets. No, the hand saw and miter box are not part of the decoration! My trusty old wood shop stool looks a bit out of place, so it will get a coat of red paint. 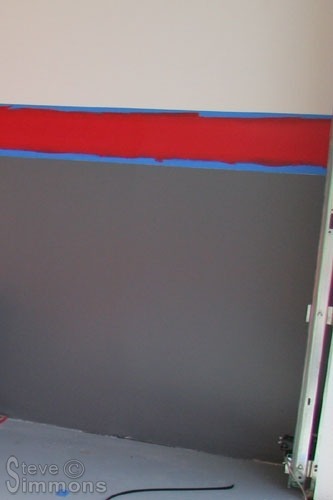 The next fun yet time-consuming project is painting the lower walls. Getting the lines straight all the way around is very difficult due to variations in the foundation, walls and floor. It needs to be very precise because several lines will be painted on and imperfections will be obvious. Care must also be taken to ensure sharp edges and to avoid bleeding colors between one another. Even during construction, maintenance must continue! 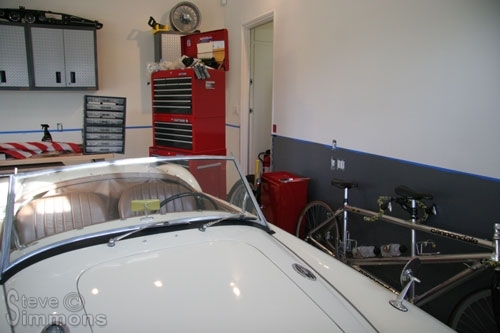 The MGA is getting a rear brake inspection and a few other minor maintenance-related tasks performed. Despite the relative mess and difficulty finding my tools and supplies, this is already MUCH better than working in the old garage! The first coat of gray going onto the lower wall. I couldn’t find a perfect gray so I custom blended one. I was very happy with the shade, but didn’t realize until it was too late that I would not be able to buy touch-up! The solution was to save as much as possible for future use. If I need to paint a large section, I will have to get a computer match performed. The decorative painting is finally completed after three days. I am quite pleased with the results! 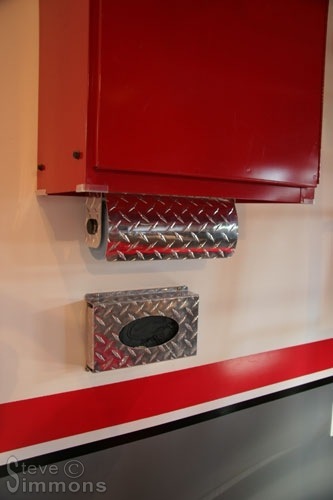 This photo also shows a couple diamond plate accessories installed. Still to follow will be diamond plate floor molding and artwork for the walls. 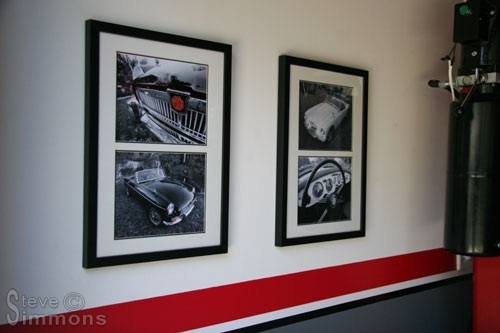 Black and white-ish photos are hung by their respective cars. The wife now has something to do, keeping the photos straight when I bump the walls while working. I think crooked photos are a pet peeve of hers. 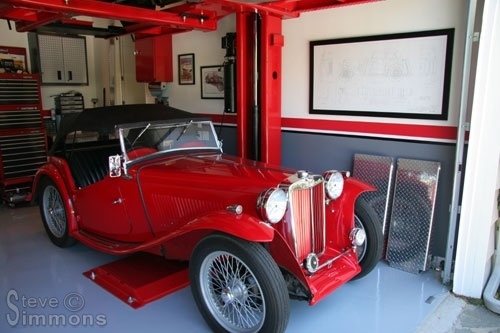 Beside the MG TC are a reprint of the factory blueprints (large frame), some TC artwork and a magazine the car was in. We took far too long in the art store deciding what style frames to use. 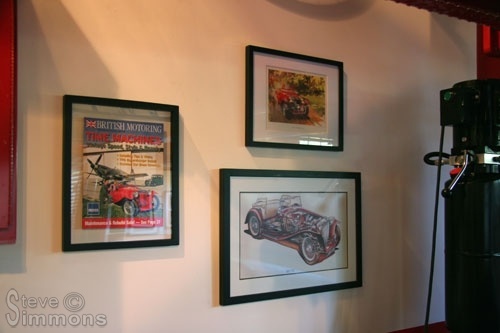 The blueprints required a custom frame and unfortunately it wasn’t cheap. An additional piece of MG TC artwork is hung with the magazine and cutaway drawing. It’s easy to get carried away and clutter up the walls, so I called it quits here until I could get used to what was there. Ultimately I decided that this was enough, and that no artwork would be hung above the level of the bottom of the lifts while raised. Still to come in this section: Diamond plate molding and more wall decorations.